“Oh Crumbs, Scary Biscuits!” is a perfectly balanced blend of the interaction, piz-zazz and imagination that has become a recognisable characteristic of Scottish Youth Theatre productions; and all the classic joy of pantomime! An intricately balanced performance, the show starts with silence, fantastical costumes and getting the audience dancing. 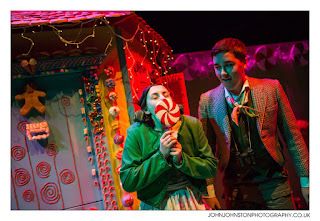 The silence doesn’t last for long though, as the show is chock-full of warmth and friendship from the cast and the audience is carried along into an all-singing, all-dancing (quite literally) fiasco with Hansel and Gretel and their hunt for home. Songs, chants, rhymes, games and lots of dances pepper the show with interaction and fun, and subtle hints as to the progression of the story draw the kids in (and entertain the bigger kids as they spot them too!). All too soon, the show wraps to a cheery close with celebratory songs, a reprise of the dance which is (by then) a firm favourite, good triumphing over evil, and every audience member being given a small momento of the show to take away with them. Heart-warming, seasonal, festive fun for big and little kids alike! Review: "Oh Crumbs, Scary Biscuits!"